Preheat the oven to 350F. Line two muffins pans with cupcake liners. In a large bowl, whisk together sugar, flour, baking soda, baking powder, cocoa powder, and salt. Slowly add egg, buttermilk, oil and vanilla and beat until combined with an electric mixer. Carefully pour in the hot coffee and mix on low speed until just combined. Fill each cupcake liner 2/3 full and bake for 18 minutes, or until a toothpick inserted into the center of a cupcake comes out clean. Whisk together egg whites, sugar and salt in the bowl of a stand mixer. Set bowl over a small pot of simmering water and whisk constantly until the sugar dissolves. You know it’s ready with the you cannot feel the sugar when you rub a small amount of mixture between your finger. Transfer the bowl to the stand mixer and use the whisk attachment to beat the egg whites into stiff peaks, about 10 minutes. The bowl should be cool to the touch before you move on. Switch over to the paddle attachment and set the mixer to medium speed. Add the butter one Tbs at a time, letting it incorporate before adding another piece. Turn the mixer up to medium-high speed and beat until the buttercream comes together. This will take a while, so don’t worry if it looks soupy or curdled at any point. I find that it helps (if it’s not cooperating) to briefly chill in the fridge for a few minutes and then remixing. 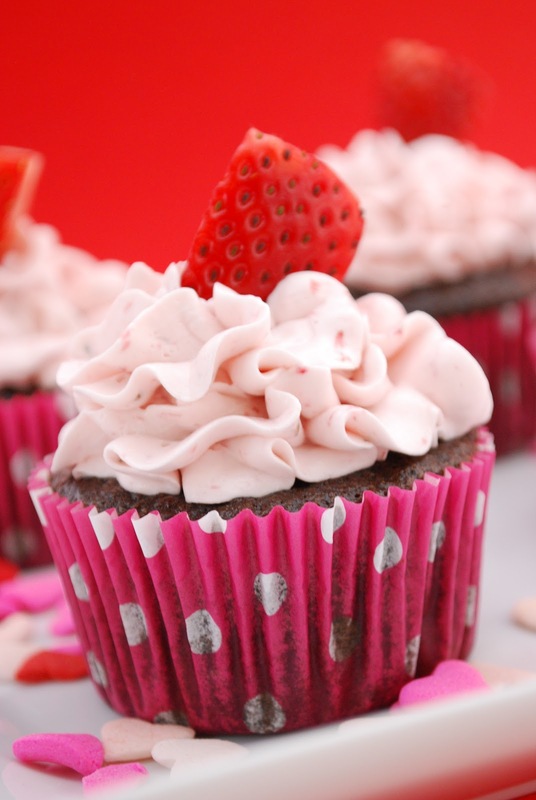 Once the buttercream is smooth and together, add strawberry puree and mix on low speed until combined. Pipe and decorate as desired.